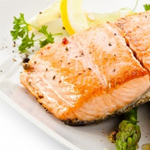 (HealthDay News) -- Two servings of fish a week may be enough to lower the heightened risk for blindness that those with diabetes face, a new Spanish study suggests. Copyright © 2017HealthDay. All rights reserved.